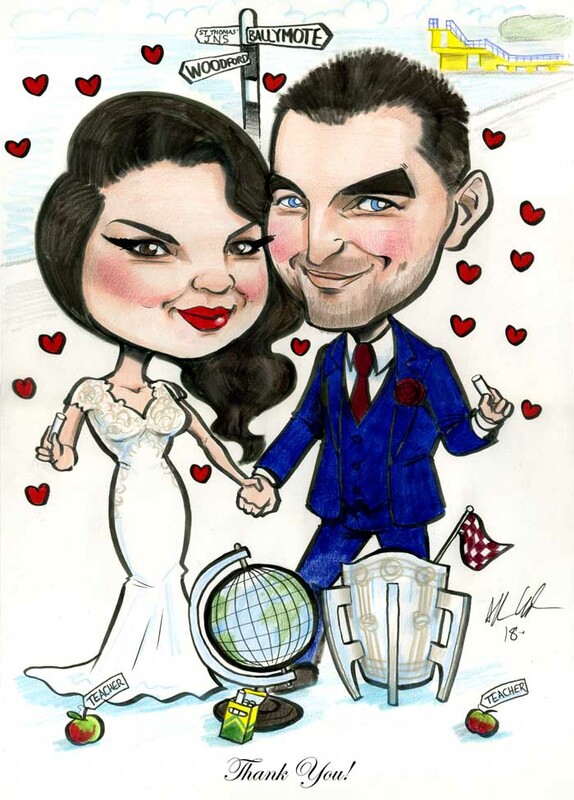 Galway Wedding Signing Boards: these recently-wed Galway teachers loved my caricature signing board! I’ve drawn them on Salthill Prom with boxes of chalk, the Liam MacCarthy Cup and a globe. You can see the Salthill Diving Boards in the background at Blackrock. Just an email to say thanks for much for the fabulous signing board for our wedding day. We were so happy with it and it’s now framed and up in our house. Lots of people commented on it on the day and it was a great addition to the decor, so thanks again! I found it tricky to find images of the Liam MacCarthy Cup for reference when drawing it before. Turns out I was spelling it wrong! I went looking again to research for this piece and one of the images on Google is my own drawing of it (or the misspelled version Liam McCarthy Cup)! Not much use to me to be using my own drawing as primary reference material! Luckily I found a few photos with the correct spelling this time! If you’re interested in a signing board for your wedding please drop me a line!